Published October 11th 2016 by Vintage Books. Goodreads Synopsis: In the Empire of Migdal Bavel, Cherry is married to Jerome, a wicked man who makes a diabolical wager with his friend Manfred: if Manfred can seduce Cherry in one hundred nights, he can have his castle–and Cherry. But what Jerome doesn’t know is that Cherry is in love with her maid Hero. The two women hatch a plan: Hero, a member of the League of Secret Story Tellers, will distract Manfred by regaling him with a mesmerizing tale each night for 100 nights, keeping him at bay. My Review: I have no idea why I didn’t get around to reading this sooner. I adored Greenberg’s debut, The Encyclopedia of Early Earth, and this second graphic novel is set in the same world. I decided not to read too much about the events of the book, so I could be surprised – and I pleasantly was! 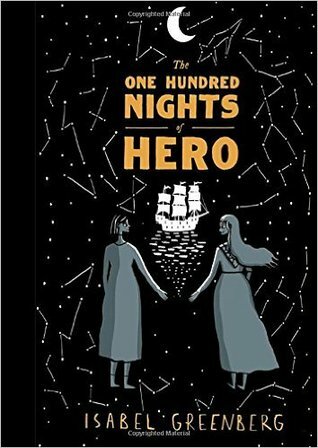 The One Hundred Nights of Hero explores a relationship between two women, one of whom, Cherry, is forced to prove her ‘purity’ to a wicked man. Hero guards Cherry, keeping the man at bay using secret stories every night. I fell in love from the protagonists from the start; I want to read more about Hero and Cherry! I also unexpectedly found myself totally absorbed in the lives of minor characters from the short stories. Part four, a fantastical romance about the moon, was so moving to me. What I also loved about the story was the witty dialogue. Honestly, it’s just brilliant. All of the stories Hero tells are cleverly interlinked and juxtaposed with the plot of the two protagonists. I absolutely adored the structure, weaving in and out of tales and Hero and Cherry’s nights. The overarching theme is about the power of storytelling for women – and it’s so beautifully done! This is a fantastically feminist take on classic fairy tales and stories. This is set in the same world of Early Earth as Greenberg’s debut. Again, the world-building is impeccable. I’ve fallen head over heels for this setting: it’s so unlike anything I’ve read before, and reads like an instant classic. Greenberg’s artwork compliments the story beautifully, from the gorgeous layouts to the use of colour. She has such a unique style and I really love it! Enchanting is probably the best word to describe this book – everything is just so mesmerising. Greenberg’s world of Early Earth is on par with Gaiman and Pullman. Overall, I would recommend The One Hundred Nights of Hero without a doubt. From its feminist themes, to its gorgeous artwork and captivating short stories – there’s something in here for everyone to admire. This graphic novel has cemented my love for Isabel Greenberg and I’m so excited to read more from her. I received a copy of The One Hundred Nights of Hero. In no way at all did this affect my thoughts. This entry was posted in Book Review and tagged book review, fantasy, graphic novel review, isabel greenberg, romance, storytelling, the encyclopedia of early earth, the one hundred nights of hero on June 28, 2017 by Gee.